At the turn of the twentieth century, the solution to a trivial problem in physics led to one of the most revolutionary theories imaginable. Now, more than a century later it seems as though history is on the verge of repeating itself with the realisation that our world, along with the rest of the observable universe, is actually a tiny drop in an ever-expanding cosmic ocean. A short time later, astronomer Edwin Hubble began measuring the Doppler Shifts of as many galaxies as possible. From his data, he was able to deduce that most galaxies were moving away from each other with velocities directly proportional to their distances. Out of this came a shocking realisation; the universe was actually expanding uniformly in all directions. Despite this great insight, accurately measuring the distances between galaxies was quite challenging. It was eventually solved with the discovery of nature’s ‘standard candles’. Type 1a supernovae always explode with the same brightness, so by comparing their apparent brightness to the ‘standard brightness’, their distance can be extrapolated via the inverse square law. The Hubble Space Telescope has provided data indicating an expansion of ~70 (km/sec)/Mpc with an uncertainty of 10%. And in a real moment of clarity, Einstein realised that his gut feeling had been right all along! He immediately removed the cosmological constant from his theory – but cosmologists had other ideas. Rather than removing the term completely, by some simple mathematical manipulations we obtain an astounding result! 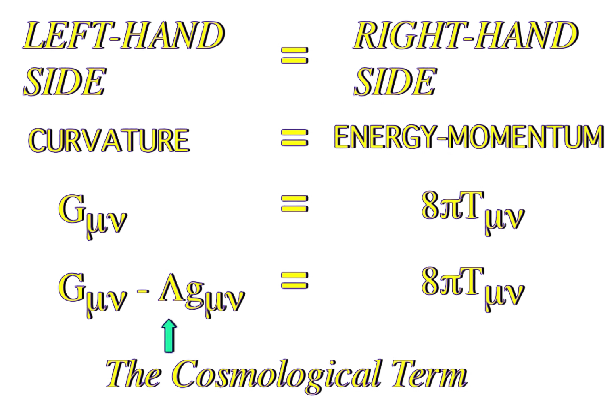 When on the left hand side of the equation, the term represented some geometric value that acted to suppress the expansion – but now on the right hand side it somehow contributes to the energy-momentum of the universe! This was a baffling prediction. Physicists and astronomers alike weren’t entirely sure of what it was, but nonetheless many predicted this ‘new’ energy to be the energy found in empty space. Regardless, we would have to interrogate nature further – we had to weigh the universe. The answer to this absurd task actually lay in a short paper published by Einstein to please an amateur astronomer by the name of Rudi Mandl. 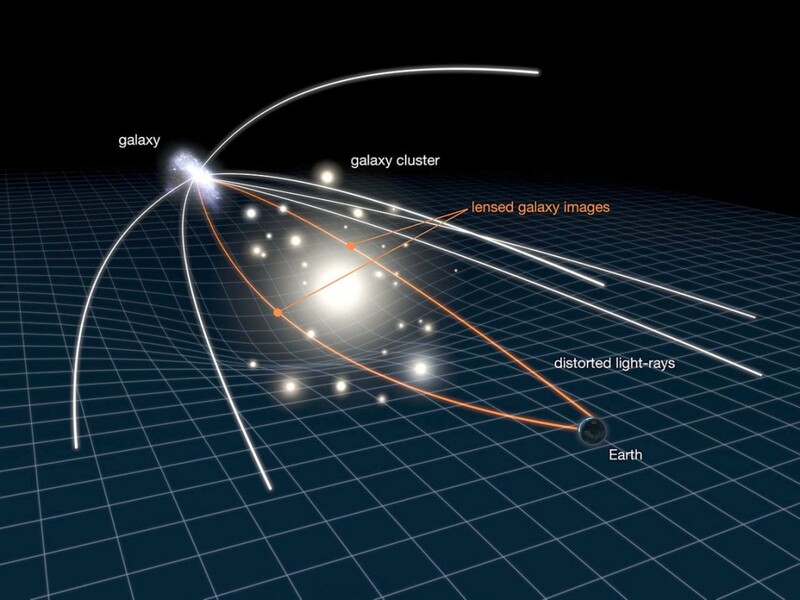 While Einstein dismissively stated “there is no great chance of observing this phenomenon”, brilliant Caltech astronomer Fritz Zwicky used the idea of ‘Gravitational Lensing’ (the bending of light around the curved space due to the presence of a significant amount of matter) to magnify and warp distant galaxies. Zwicky proposed that by measuring the curvature of space (bending of light) around a supercluster that we could determine the density of matter in that supercluster and hence deduce the total amount of mass present in the universe. And he was spot on. 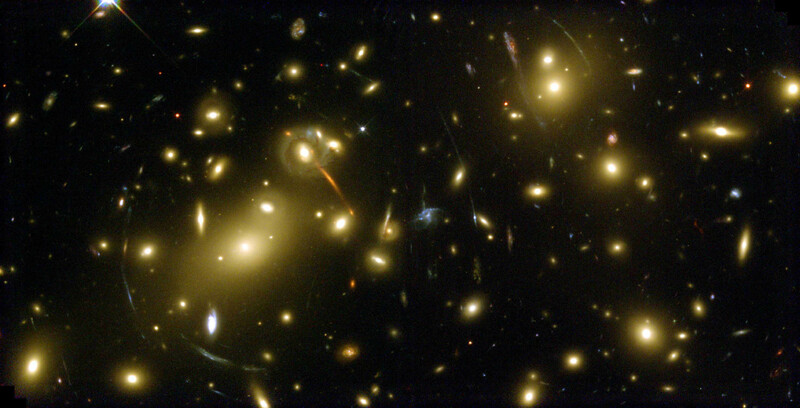 A brilliant image taken by Hubble shows the effect of gravitational lensing in action. The circular warping, stretching and magnifying of the galaxy is clearly visible around the edges of the image. Physicist Tony Tyson eventually calculated the mass distribution of a supercluster photographed much earlier than the image above via Zwicky’s method. He and his team generated a graphical view of the mass distribution to high precision. This graphical topology illuminates something that is very surprising indeed. 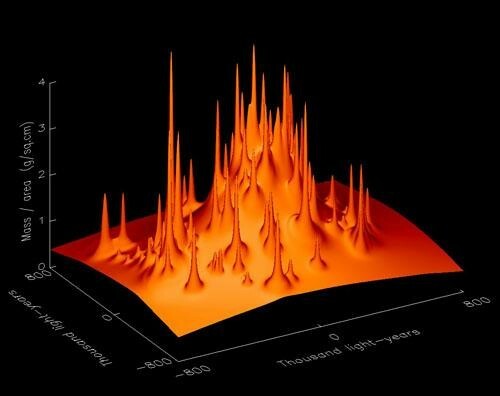 The spikes represent the visible locations of all the galaxies within the cluster. Put another way, all baryonic matter (the protons and neutrons that form all visible matter) make up only a fraction of the total mass in the system. As much as 40 times that is located between galaxies (the smooth bulky distribution located below the spikes in the image above). This was actually not that surprising though – earlier observed phenomena showed stars in the outer arms of spiral galaxies to be rotating with a velocity almost identical to those of stars located near the centre. This was simply not possible by accounting for all visible matter – either there was some ‘invisible mass’ located outside of the clusters or our theory of gravity was wrong. And let’s just say that it seemed as though Newton’s universe had already been overturned one time too many. With that, the search for the elusive ‘dark matter’ began! Now while we don’t really understand what dark matter is, we know that it plays a very important role in holding our universe together. But confirmation for the existence of ‘dark matter’ happened to be an offshoot from our quest to ‘weigh the universe’. I never mentioned why we decided to in the first place. Well by knowing how much mass is in our universe, we can actually determine the type of universe we live in  – and this may very well answer the initial problem we were faced with – the meaning behind the cosmological constant. 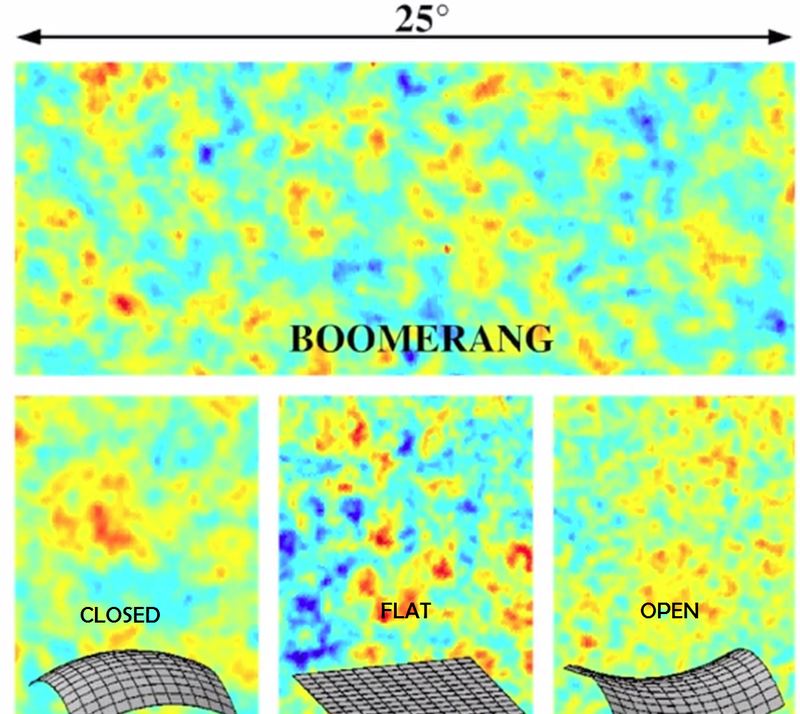 Image Credit:  Closed, Open and Flat universes respectively. 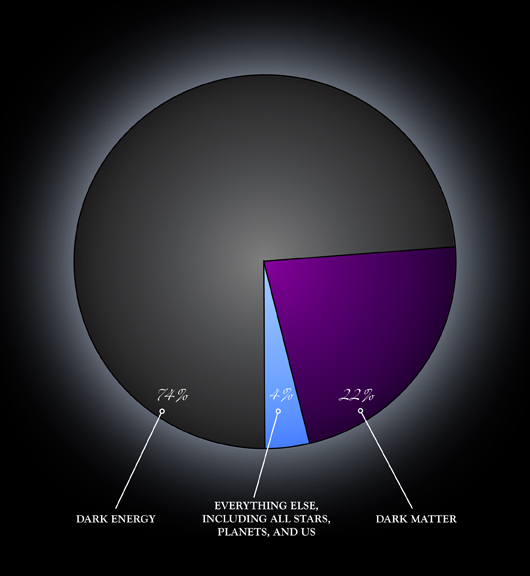 After calculating the density of the universe, astronomers found that only about one-third of the mass exists necessary for a flat universe (accounting for both baryonic and dark matter). This would indicate that we live in an open universe. But why did we even compare it to a flat universe in the first place? Well according to Lawrence Krauss, theoretical physicists had good reasons to; “firstly it was the only mathematically beautiful universe … [and secondly] it turns out that in a flat universe the total energy of the universe is precisely zero”. This removes the need for energy to be present prior to the big bang, but that is for another time. Thus an alternative method was desperately needed. Finally a breakthrough arrived thanks to the Cosmic Microwave Background Radiation. WMAP was able to accurately detect radiation emitted from the universe when it was around 370,000 years old. Just prior to this time the universe was so hot that all matter existed as a charged plasma. As a result, the radiation was actually absorbed, limiting our ability to see past this period. This allows us to clearly see the cooling clumps of matter begin condensing. Also, according to General Relativity, information cannot travel faster than the speed of light. Ultimately, this limits the size of these clumps (as the matter only ‘knows’ to collapse when it receives information ‘telling it’ to). This means we can literally map the sizes of these clumps as they appeared. The clumps observed mimicked those predicted by a flat universe exactly! That’s right. The cosmological constant! We now have very real experimental data supporting it! So if it acted to suppress the expansion of space on the LHS, then what does it mean on the RHS?! 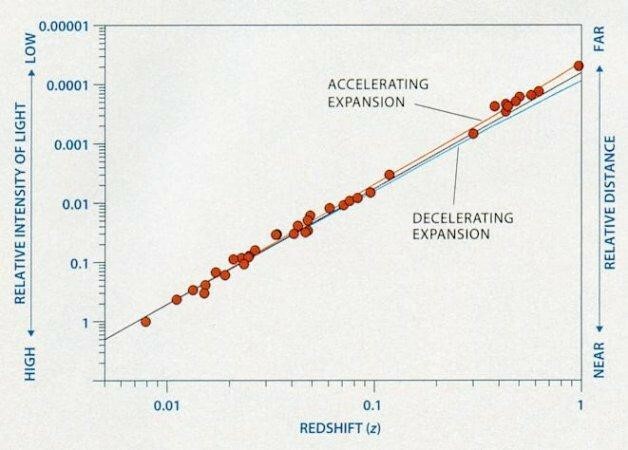 In 1998, two teams of astronomers set out to obtain a more precise value for the rate of expansion using much more precise equipment (Hubble Telescope). Below shows the resulting graph. Looking at the graph in more detail, we see the bundle of data points located toward the top right actually lay above the line of best fit. This result certainly was not predicted! In effect, it shows that more distant galaxies are moving with a faster relative velocity! So not only is the universe expanding, but it is accelerating in its expansion! And if we calculate the amount of energy we would have to put into empty space to obtain this result – it turns out to be exactly the amount we were missing before! Ultimately, this is Einstein’s cosmological constant – and we don’t have the slightest idea why it’s there. And that, in a nutshell, is Dark Energy. The subtitle is actually quite literal. The incognito matter that serves to hold the universe intact along with the mysterious energy that permeates space both share a distinctive commonality. A lack of interaction with the electromagnetic force, essentially making them invisible to us. However one must be careful not to misinterpret this notion; significantly well-grounded data undisputedly indicates one of two things: that these two things really do exist, or our current models of the universe went very wrong somewhere along the line! Weakly Interacting Massive Particles (WIMPs): thought to be quite large and slow, WIMPs are believed to interact with the weak nuclear force. In order to obtain the amount of dark matter observed via thermal production in the early universe, their mass would have to be 100 GeV. Coincidently, Supersymmetry also predicts a new particle at this range, however the theory itself lacks support. Another prediction is that interacting WIMPs emit gamma rays of specific energies – but observations from NASA’s Fermi Gamma-ray Telescope have failed to detect any such gamma rays. Axions: particles of relatively small mass that interact weakly with electromagnetism, developed out of Quantum Chromodynamics. Massively Compact Halo Objects (MACHOs): extremely large objects (similar to black holes and neutron stars) meaning they have very high densities. The smooth motions of galaxies indicates that the dark matter is rather more uniformly distributed though. Similar predictions to CDM, with the main difference being the mass distribution and constituent particles. Sterile Neutrinos: much like normal neutrinos as they don’t interact electromagnetically but do gravitationally. The main difference is that the sterile neutrino would not interact via the weak force (decay of neutrons into protons). Gravitinos: the still un-observed force carrier (particle) for gravity (much like the photon for light). The main difference with HDM is that the constituent particles travel at ultra-relativistic speeds. Neutrinos: essentially the only candidate, standard neutrinos are thought to have a tiny mass (allowing for their oscillations). While they fulfil the main criteria, their mass likely does not exceed 0.3 GeV and they do not group together. This makes them an unlikely candidate. Physicists all over the world are conducting underground experiments using masses of Germanium cooled to just above absolute zero. Even though dark matter interacts extremely weakly with baryonic matter, every so often a particle could deflect off an atom of Germanium which would slightly raise its temperature. Simultaneously, the LHC may be able to actually create and detect dark matter from the collisions between high speed particles (conditions of the early universe). Our best bets are currently on the Lambda CDM model (WIMPs, CDM), but with a new generation of young minds, perhaps we will learn that the answer lay hidden in plain sight. And with that, I shall leave you with one of the most astounding graphs in science – along the knowledge that everything you see around you, the birds, the trees, and all those stars, constitutes a mere 4% of what exists in our universe. – Krauss, L. ‘Krauss ’09: A Universe From Nothing’. 2014. Lecture by Lawrence Krauss on his book titled ‘A Universe from Nothing’. YouTube. [ONLINE] Available at: https://www.youtube.com/watch?v=0ZiXC8Yh4T0. [Accessed 05 October 2014]. – Einstein – Documentary – YouTube. 2014. History Documentaries. [ONLINE] Available at: https://www.youtube.com/watch?v=CVPBBZR3qrU. [Accessed 05 October 2014]. – Krauss, L. 2012, a universe from nothing: why there is something rather than nothing, Simon & Schuster, Great Britain. – 1929: Edwin Hubble Discovers the Universe is Expanding | Everyday Cosmology. 2014. Carnegie Science. [ONLINE] Available at: http://cosmology.carnegiescience.edu/timeline/1929. [Accessed 05 October 2014]. – Dark Energy – Type Ia Supernovae. 2014. HubbleSite. 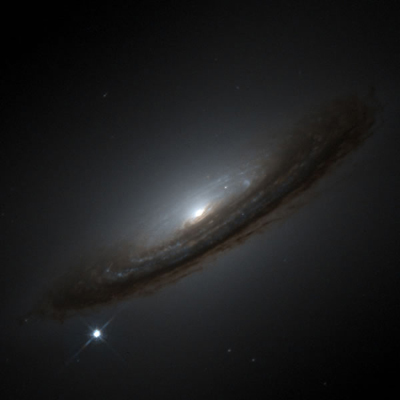 [ONLINE] Available at: http://hubblesite.org/hubble_discoveries/dark_energy/de-type_ia_supernovae.php. [Accessed 05 October 2014]. – Gravitational Lensing. 2014. NASA. [ONLINE] Available at: http://imagine.gsfc.nasa.gov/docs/features/news/grav_lens.html. [Accessed 06 October 2014]. – The Expanding Universe (Cosmology: Ideas). 2014. American Institute of Physics. [ONLINE] Available at: http://www.aip.org/history/cosmology/ideas/expanding.htm. [Accessed 06 October 2014]. – 1917: Albert Einstein Invents the Cosmological Constant | Everyday Cosmology. 2014. Carnegie Science. [ONLINE] Available at: http://cosmology.carnegiescience.edu/timeline/1917. [Accessed 06 October 2014]. – Dark Matter or Modified Gravity? Two Competing Theories Battle. 2014. From Quarks to Quasars. [ONLINE] Available at: http://www.fromquarkstoquasars.com/dark-matter-or-modified-gravity-two-competing-theories-battle/. [Accessed 11 October 2014]. – Gravitational Lensing of the CMB. 2014. University of California. [ONLINE] Available at: http://dls.physics.ucdavis.edu/~scranton/LensedCMB/physics.html. [Accessed 06 October 2014]. – Dark Matter: Strong Gravitational Lensing | LSST. 2014. Large Synoptic Survey Telescope. [ONLINE] Available at: http://www.lsst.org/lsst/science/scientist_dark_matter. [Accessed 06 October 2014]. – Spiral Galaxies. 2014. Massachusetts Institute of Technology. [ONLINE] Available at: http://web.mit.edu/redingtn/www/netadv/specr/012/node3.html. [Accessed 06 October 2014]. 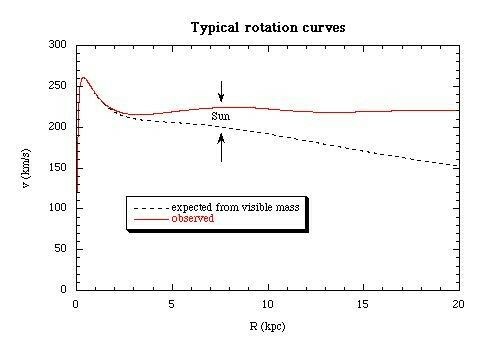 – Galactic rotation curves. 2014. Science and Technology Facilities Council (UK). [ONLINE] Available at: http://hepwww.rl.ac.uk/ukdmc/dark_matter/rotation_curves.html. [Accessed 06 October 2014]. – Shape of the Universe: Closed, Open, or Flat. 2014. Berkeley Lab. [ONLINE] Available at: http://www2.lbl.gov/Science-Articles/Archive/SNAP-3.html. [Accessed 06 October 2014]. – WMAP- Shape of the Universe. 2014. NASA. [ONLINE] Available at: http://map.gsfc.nasa.gov/universe/uni_shape.html. [Accessed 06 October 2014]. – The Accelerating Universe. 2014. Royal Swedish Academy of Science . [ONLINE] Available at: http://www.nobelprize.org/nobel_prizes/physics/laureates/2011/advanced-physicsprize2011.pdf. [Accessed 11 October 2014]. – Does Gravity Travel at the Speed of Light? 2014. University of California. 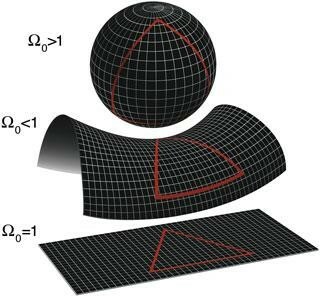 [ONLINE] Available at: http://math.ucr.edu/home/baez/physics/Relativity/GR/grav_speed.html. [Accessed 06 October 2014]. – A cosmological surprise: the universe accelerates. 2014. European Southern Observatory. [ONLINE] Available at: https://www.eso.org/~bleibund/papers/EPN/epn.html. [Accessed 06 October 2014]. – Type Ia Supernova . 2014. Universe Review . [ONLINE] Available at: http://universe-review.ca/R02-08-typeIa.htm. [Accessed 06 October 2014]. – Cosmology Primer: The Early Universe. 2014. Preposterous Universe. [ONLINE] Available at: http://preposterousuniverse.com/writings/cosmologyprimer/early.html. [Accessed 11 October 2014]. – Original Boomerang Press Page. 2014. Case Western Reserve University. [ONLINE] Available at: http://cmb.phys.cwru.edu/boomerang/press_images/. [Accessed 11 October 2014]. – WFIRST Dark Energy. 2014. Caltech University . [ONLINE] Available at: http://www.ipac.caltech.edu/wfirst/overview/science/darkenergy/. [Accessed 11 October 2014]. – Dark Matter Tomography, Tony Tyson. 2014. Bell Labs. [ONLINE] Available at: http://www.slac.stanford.edu/cgi-wrap/getdoc/ssi98-004.pdf. [Accessed 11 October 2014]. – Millis, J.P., What is Dark Matter? 2014. About.com . [ONLINE] Available at: http://space.about.com/od/deepspace/a/What-Is-Dark-Matter.htm. [Accessed 11 October 2014]. – Millis, J.P., Cold Dark Matter (CDM). 2014. About.com . [ONLINE] Available at: http://space.about.com/od/astronomydictionary/g/Cold-Dark-Matter.htm. [Accessed 11 October 2014]. – Millis, J.P., Warm Dark Matter. 2014. About.com . [ONLINE] Available at: http://space.about.com/od/astronomydictionary/g/Warm-Dark-Matter.htm. [Accessed 11 October 2014]. – Millis, J.P., Hot Dark Matter. 2014. About.com . [ONLINE] Available at: http://space.about.com/od/astronomydictionary/g/Hot-Dark-Matter.htm. [Accessed 11 October 2014]. – WMAP- Expansion of the Universe. 2014. WMAP- Expansion of the Universe. [ONLINE] Available at: http://map.gsfc.nasa.gov/universe/uni_expansion.html. [Accessed 12 October 2014]. Prev Confronting Aliens: Are We In Danger?